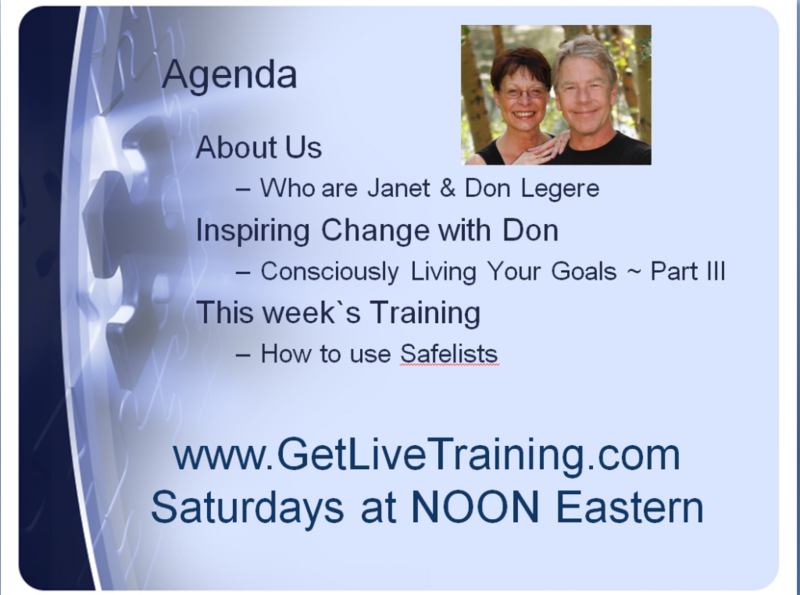 On our live webinar, Don talked about Part III of Consciously Living your goals with a focus on “hard work” and Janet talked about Safelists and Credit Based Lists, what they are and how to use them. Enjoy the replay of this great webinar below. Signup and confirm – You will need two email addresses, one for Admin and one for the List. Admin email is for the Admin of the Safelist to contact you about admin topics. The List email is where you will receive email ads from other members of the safelists. Setup banner and/or text ads – You will want to setup your Banner and Text ads for YOUR business or product. Most safelists offer you the option to setup banner and text ads in their systems. These ads rotate among the members of the list. Schedule when you can send your ad – Your schedule will be based on your membership level. Free members usually have the ability to send once a week. Each list is different, so make sure you check what the rules are for each list. Google Calendar has a great scheduling reminder! Send your ad on scheduled days – This is a very important step. Sending your ads on a regular basis is going to create results. It’s best to promote a Lead Capture page so you can build YOUR list from these safelists. Review emails from other members – You will receive emails from other Safelist members who are sending ads for their business. It’s recommended that you create a filter for your List Email so as to avoid an overflowing inbox. It’s also recommended that you use Gmail for both your admin and list emails. Gmails makes it simple to manage emails and create schedules. Gather email and Skype details – This is one area most people miss out on. The emails that arrive in your inbox may be filled with valuable contact information. When a member includes their personal email or Skype details, you can then follow-up and make contact. Networking with other list members can prove to be very fruitful. Find Catchy Titles – This is one area that is often overlooked. When trying to come up with new headlines, it can be a challenge. The truth is, your inbox is full of ideas from other members. Notice what catches your attention and find was to adapt and incorporate these ideas into your marketing. Find good Ad copy – Headlines are the only challenge. Creating good ad copy is always a challenge. Just like the headlines, your inbox can become a useful resource for writing your own ads. Credit Lists are Similar to Safelists with the difference being that Members are incentivized to read your email. As with Safelists, you will require two email addresses. You will need two email addresses as stated above. One for Admin of the safelist and the other for receiving the email ads from other members. We highly recommend you setup two account with Gmail just for your Safelists and Credit lists. Once you register, you will need to confirm both email addresses. You will not be able to use your account until both email addresses are confirmed. Once confirmed, you can login and setup Banner ads and Text ads for your opportunity and then schedule your advertising. We recommend that you advertise either another advertising tool or BEST is to advertise YOUR Lead Capture Page to build YOUR list. Safelist members respond exceptionally well to other effective lists and resources and they respond best when you ask them to subscribe to your list or read your blog post – YES, Safelist members read ads! Join and setup ONE list and get it running smoothly. This is VERY important in the process. Add other lists as time allows and create a schedule of mailings. Keep track of your lists in a spreadsheet or on your Google Calendar. Submitters can be useful ~ more advanced process where you can use a submitter for Safelists. The Submitters are not designed for credit based lists, only safelists and it’s a way to reach thousands of lists with one post. You will find all our TOP recommended programs in the downline builder of Prospect Geyser Coop, our own Credit Based and highly responsive list. Next Week, Jonah Klimack will be our guest talking about the return of List Joe and how you can benefit. Mark your calendar and plan to attend on Saturday, October 13 at Noon Eastern. One tool I forgot to mention was Traffic Zipper. Traffic Zipper is a list manager for Credit based lists and saves hours every month. If you belong to more than 5 Credit based lists and they are in the Traffic Zipper system, it’s well worth the time to setup and use it. I have my Traffic Zipper setup to automatically send my ads. It’s a life saver! Remember, you will find all our TOP recommendations in the downline builders of the programs we own such as Contact List Builder, Prospect Geyser, Prospect Geyser Coop and PG Traffic. If you belong to any of these programs, login and check the downline builder for our recommendations. NOTE: In Prospect Geyser the downline builder is located under Add-On Tools. I look forward to reading your comments, thanks for liking us and sharing us Socially. This was a nice refresher for me. Haven’t used safe lists in a very long time.